David Brooks has written a column about it, in The New York Times. Daniel J. Hopkins, who is a professor of political science at the University of Pennylvania, has written a whole book about it (see the picture to the left). Is the "nationalization" of our politics a good thing or a bad thing? I haven't read Hopkins' book, so I don't know his views. The title suggests that he is writing as an "observer," more than anything else, reporting on a fact of our contemporary political life, rather than taking any specific position on whether this change in our politics is a good thing or a bad thing. Brooks definitely has a position, and he doesn't like it. 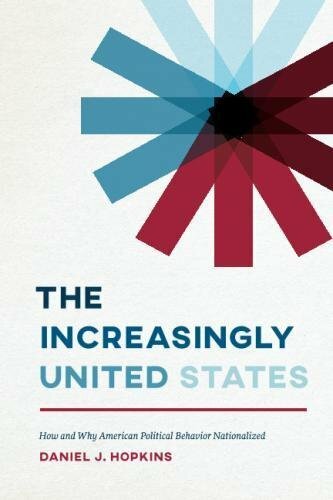 In fact, Brooks believes that the nationalizing of our political life is leading to the "unraveling" of the United States as a political community, dividing the nation into two distinct, different, and irreconcilable camps. The "Venn diagram is dead," says Brooks. "There is no overlapping area." I tend to side with Brooks. I think my favorite political theorist, Hannah Arendt, would do so, too. Arendt celebrated the "federal" nature of American government, which sets up lots of competing centers of political power, making authoritarian and totalitarian central government less likely. California's effort to fight the Trump initiatives on immigration and environmental policy are great examples of how our federal government is supposed to work. "Nationalized" government discards that conflict in an "all or none" fight for central political power. All political eyes focus on the federal government, the arena in which individual persons have the least likelihood to be able to influence political choices.